A variety of natural materials were used in the design of the outdoor classroom. Several varieties of trees were planted throughout the space, as well as areas of Zebra grass and flowers. 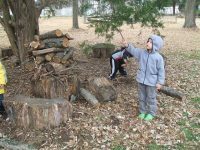 The children have access to tree cookies, gravel, sand, large stones, mulch, tree limbs, logs and a large area of grass. All of the elements in the classroom were chosen because of low maintenance and durability. Items in the Building Area and Messy Materials Area (stones, tree limbs, logs, tree cookies, etc.) are all durable enough to be outside, yet easy and cost-effective to replace when the time comes. Most of the elements in the outdoor classroom were built using sturdy wood or recycled materials. 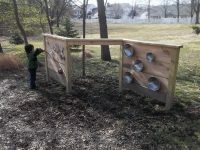 Recycled elements include tractor tires incorporated into the Climbing Area, pots and pans in the Music Area, PVC pipes and paving stones in the Building Area, a PVC pipe easel in the Nature Art Area, and a 14′ wooden john boat that was turned into a sandbox. 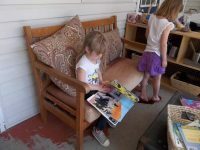 Throughout the creation of the outdoor classroom, the staff personalized and filled it with things that the children were interested in and/or helped create. Tree cookies were made from a tree that fell on one of the children’s houses during a storm. Building materials (paving stones and PVC pipes) were donated by parents that had them leftover from DIY projects. Several parents helped to complete projects, including child-sized picnic tables, the climbing platform, and the Digging Area. Birdhouses were built and donated by one of the grandfathers and each classroom at the center created a unique wind chime that was included in the Music and Movement Area. 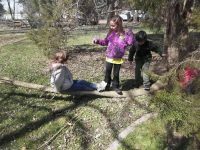 The Outdoor Classroom Open House will take place on Saturday, April 20th. Families, friends and the surrounding communities will share in the daily experiences of the children. 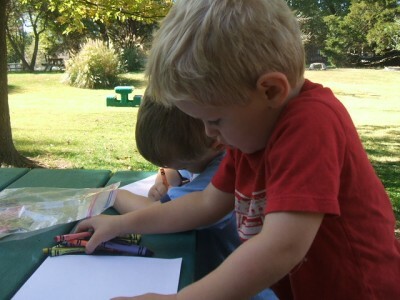 Planned activities include nature-based story time, painting toad houses, bug catching expeditions, and found object sculpture making. A family camp-out is also being planned for the summer. 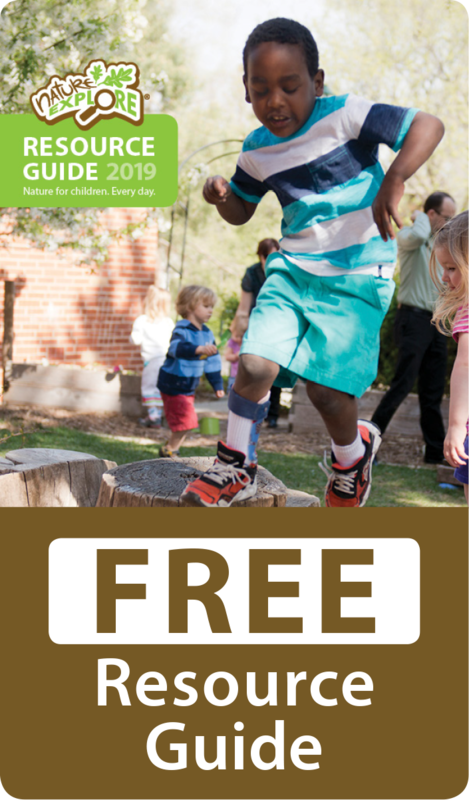 In addition to these activities, information on the importance of getting kids outside is continually shared with families through flyers social networking sites and e-mail. 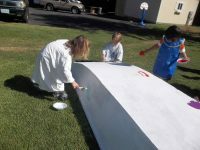 Kids International also hosted two Outdoor Classroom Workshops, sponsored by United for Children.